Since June 1998, increasing seismic activity in the vicinity of Sete Cidades volcano has resulted in occasional seismic swarms. On the night of 2-3 August about 120 events were registered in 3 hours. During that period, five earthquakes were felt along the W coast, the strongest with a magnitude of 3.1 reached a maximum intensity of V (MM) at Ginetes e Varzea. Similarly, on 2 September in Sao Miguel more than 120 events occurred beneath the sea floor over a period of about 4 hours near shore between Ponta da Ferraria and Mosteiros. One of the five felt earthquakes during this period also reached an intensity of V (MM). There were no reports of injury or damage from any of these events. Information Contacts: João Luis Gaspar and Nicolau Wallenstein, Departamento de Geociencias, Centro de Vulcanologia, Universidade dos Açores, Rua Mae de Deus, 9500 - Ponta Delgada, Sao Miguel, Açores, Portugal. The Global Volcanism Program has no Weekly Reports available for Sete Cidades. 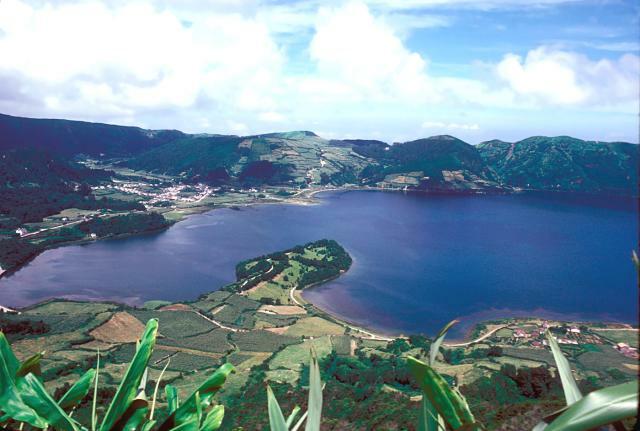 Sete Cidades volcano at the western end of Sao Miguel Island contains a 5-km-wide summit caldera, occupied by two caldera lakes, that is one of the scenic highlights of the Azores. The steep-walled, 500-m-deep caldera was formed about 22,000 years ago, and at least 22 post-caldera eruptions have occurred. A large group of Pleistocene post-caldera trachytic lava domes, lava flows, and pyroclastic-flow deposits is found on the western-to-northern flanks. A nearly circular ring of six Holocene pyroclastic cones occupies the caldera floor. These have been the source of a dozen trachytic pumice-fall deposits erupted during the past 5000 years. Sete Cidades is one of the most active Azorean volcanoes. Historical eruptions date back to the 15th century and have occurred from within the caldera and from submarine vents off the west coast. This volcano is located within the Azores, a UNESCO Global Geopark property. Booth B, Croasdale R, Walker G P L, 1978. 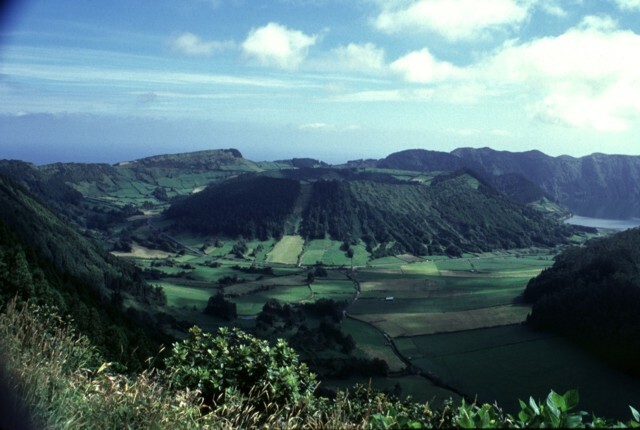 A quantitative study of five thousand years of volcanism on Sao Miguel, Azores. Phil Trans Roy Soc London, Ser A, 288: 271-319. Martins J A, 1982. Excursion guide for field trip V1, Island of Sao Miguel. Proc Internatl Symp Activity Oceanic Volc, Archipelago Univ Azores, 3: 315-328. Moore R B, 1983. Preliminary geologic map of Sete Cidades volcano, Sao Miguel, Azores (1:18,000). U S Geol Surv Open-File Rpt, 83-742. Moore R B, 1990. Volcanic geology and eruption frequency, Sao Miguel, Azores. Bull Volcanol, 52: 602-614. Moore R B, 1991. Geologic map of Sao Miguel, Azores. U S Geol Surv Map, I-2007. Neumann van Padang M, Richards A F, Machado F, Bravo T, Baker P E, Le Maitre R W, 1967. Atlantic Ocean. Catalog of Active Volcanoes of the World and Solfatara Fields, Rome: IAVCEI, 21: 1-128. Newhall C G, Dzurisin D, 1988. Historical unrest at large calderas of the world. U S Geol Surv Bull, 1855: 1108 p, 2 vol. Zbyszewski G, Moitinho de Almeida F, Veiga Ferreira O da, Torre de Assuncao C, 1958. Geologic map of Sao Miguel (Azores). Servicos Geologicos Portugal, two 1:50,000 scale maps with 22 and 37 p texts (in Portuguese). There is data available for 16 Holocene eruptive periods. There is no Deformation History data available for Sete Cidades. There is no Emissions History data available for Sete Cidades. Both Lagoa Verde (Green Lake) in the foreground and Lagoa Azul (Blue Lake) appear blue in color in this view from the southern rim of the 5-km-wide summit caldera of Sete Cidades volcano on Sao Miguel Island. A nearly circular ring of six Holocene pyroclastic cones occupies the caldera floor. Sete Cidades is one of the most active Azorean volcanoes. Historical eruptions date back to the 15th century and have occurred from within the caldera and from submarine vents off the west coast. Photo by Rick Wunderman (Smithsonian Institution). A nearly circular ring of six Holocene pyroclastic cones occupies the floor of 5-km-wide Sete Cidades caldera. These have been the source of a dozen trachytic pumice-fall deposits erupted during the past 5000 years. Three of these forested cones appear in this view from the southern caldera rim, Caldeira Seca (extreme left), Caldeira do Alferes (left-center), and Seara (right center). The cones were constructed on the caldera floor adjacent to the two lakes of Lagoa Azul (top right) and Lagoa Verde (bottom right). Photo by Rick Wunderman, 1997 (Smithsonian Institution). 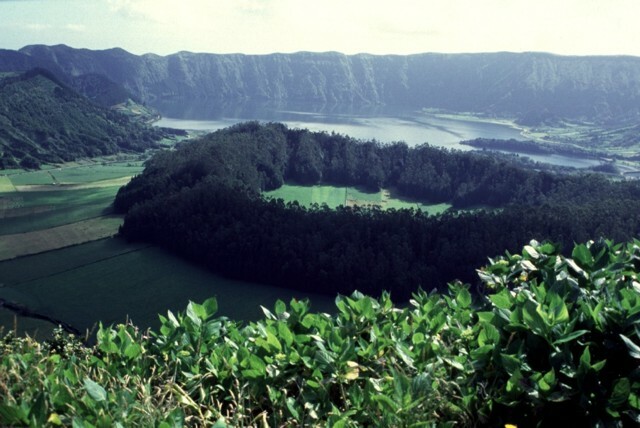 The Caldeira Seca pumice ring (center) was formed during a 15th-century explosive eruption through the Sete Cidades caldera lake. A 1444 date is considered the most likely, although dates of 1439 and 1440 are sometimes listed. The Sete L tephra deposit originated from the 600-m-wide, 100-m-deep pumice ring, which is located on the SW floor of the Sete Cidades caldera, whose NE wall forms the horizon. The SE floor of Sete Cidades caldera contains a large trachytic lava dome that is cut by two lake-filled craters. The rim of Lagoa de Santiago crater is visible at the center, to the right of the Lagoa Azul and Lagoa Verde lakes occupying the caldera floor. 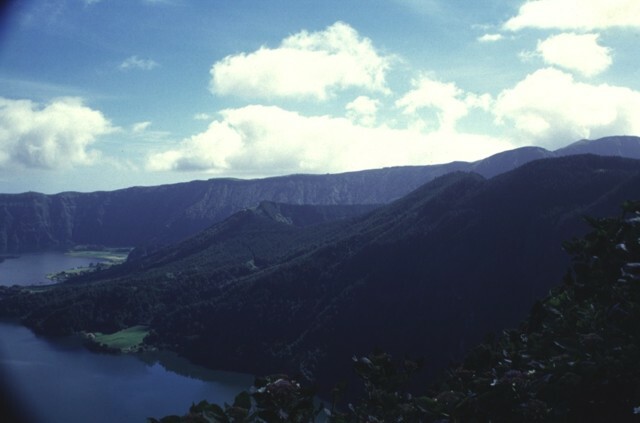 The Lagoa Rasa crater rim appears at the extreme right, below the rim of Sete Cidades caldera. Lagoa de Santiago was the source of a major explosive eruption about 1900 years ago, and Lagoa Rasa erupted several centuries later. Caldeira do Alferes (center) is one of a group of six pyroclastic cones constructed on the floor of Sete Cidades caldera. The adjacent cone of Seara appears to the right of Caldeira do Alferes in this view from the western caldera rim. Strong eruptions of trachytic pumice occurred a dozen times during the past 5000 years from Sete Cidades, one of the most active volcanoes of the Azores. 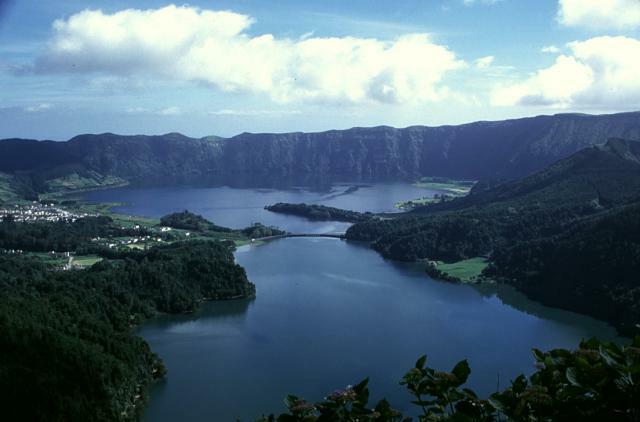 A small peninsula juts into Lagoa Azul ("Blue Lake"), one of two lakes partially filling the summit caldera on Sete Cidades volcano at the western end of Sao Miguel Island. The 5-km-wide caldera was formed about 22,000 years ago, and at least 22 post-caldera eruptions have occurred. This view looks to the NW from the rim of a post-caldera cone, Caldiera Grande. 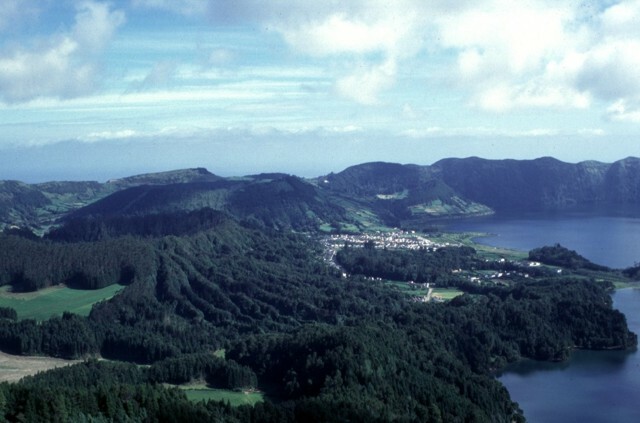 Two other post-caldera cones, Caldiera do Alfreres and Seara Cerrado da Ladeira, lie across the lake, behind and to the right of the town of Sete Cidades. Photo by R.V. Fisher, 1980 (University of California Santa Barbara). The Global Volcanism Program has no maps available for Sete Cidades. There are no samples for Sete Cidades in the Smithsonian's NMNH Department of Mineral Sciences Rock and Ore collection. Large Eruptions of Sete Cidades Information about large Quaternary eruptions (VEI >= 4) is cataloged in the Large Magnitude Explosive Volcanic Eruptions (LaMEVE) database of the Volcano Global Risk Identification and Analysis Project (VOGRIPA).